← Banh Mi – Oh My! 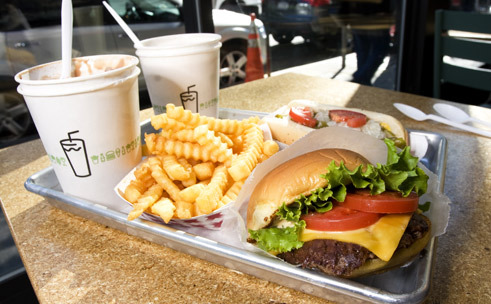 Shake Shack is a burger institution in New York City. From their original location in Madison Square Park, they expanded rapidly throughout the city and are slowly taking over the globe with outposts recently opened in Westport, CT, Miami and even the Middle East. So piggybacking on the outdoor burger, shakes and fries trend, Stephen Starr (who pretty much monopolizes Philadelphia with his various themed dining establishments) opened a little burger hut in Franklin Square a few years ago known simply as “Square Burger”. 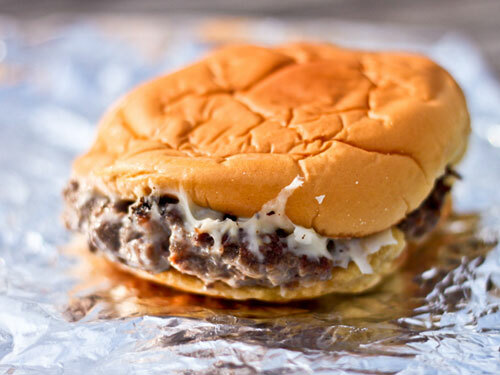 Notorious for milkshakes containing TastyKakes butterscotch krimpets that can only be consumed through wide straws, Square Burger is the closest Philadelphians can come to enjoying a burger outdoors short of grilling in their own backyard. I’d heard plenty of good things about Square Burger, so I set out July 4th weekend poised to dive into one of the most talked about burgers in town. Sure enough, when I arrived in Franklin Square the line was long; but that meant it had to be worth it then, right? When I finally got to the front of the line, I ordered a cheeseburger, fries and a drink and waited patiently for my meal to be ready. Despite the long lines Square Burger endures, every burger is cooked to order so you don’t have to worry about food sitting out – and that’s how a good burger should be made. I took my sack of food and sat at a nearby picnic table, enjoying the warm and sunny day. As I snacked on their fresh cut shoestring fries, I removed the burger from the bag and was kind of surprised by its miniscule size. Then I unwrapped the paper to reveal a tiny, squished mess. This was it?? I had just paid $4.75 for something the size of a 99 cent McDonald’s hamburger. Well, then it better be the best damn burger I’ve ever tasted, I thought to myself. Yep. This is what it looked like. They should change the name to Sad Burger. Anyway, about a month or so later, I actually went to Shake Shack for the first time and was blown away. Square Burger couldn’t even hold a candle to a Shake Shack burger. Shake Shack’s burgers have tomato and lettuce, options you’re not given at Square Burger, which help to compliment it perfectly. Not to mention a nice, thick delicious juicy patty on a soft bun, which doesn’t look like someone sat on it when you get your order – plus crinkle cut fries! It just goes to show that you can try and imitate something but you can never duplicate it. Posted in bad, burgers, shake shack, square burger. Bookmark the permalink.